Born near Middleburg, Ohio, March 29, 1842, he attended Ohio University at Athens and graduated from Cincinnati Law School in 1866. He joined the Army as Private, Company B, 2nd Ohio Volunteer Infantry and served with it April 17-August 9, 1861. He was then appointed First Lieutenant, 5th West Virginia Volunteers, September 15, 1861 and promoted to Captain of that unit on April 19, 1862 and to Lieutenant Colonel, September 29, 1863. He was transferred to the 1st West Virginia Veteran Infantry, November 9, 1864 and promoted to Colonel of that unit on December 23, 1864. He was breveted Brigadier General, United States Volunteers, 1865. Following the war he was admitted to the Bar and began the practice of law at Ironton, Ohio. He was elected to the Ohio House of Representatives and served there in 1870-71; he was elected to the United States House of Representatives from Ohio as a Republican and served in the 52-53 Congresses (1891-93). He served there until his death at Ironton, Lawrence Country, Ohio, on July 13, 1893. He was buried in Section 3, Grave 2021, of Arlington National Cemetery. 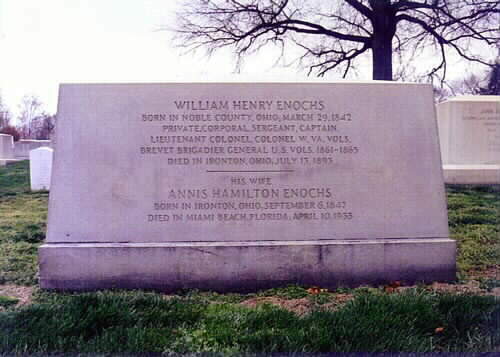 His wife, Annie Hamilton Enochs, who was born in Ironton, Ohio, on September 6, 1847, and who died at Miami Beach, Florida, in April 1935, is buried with him. 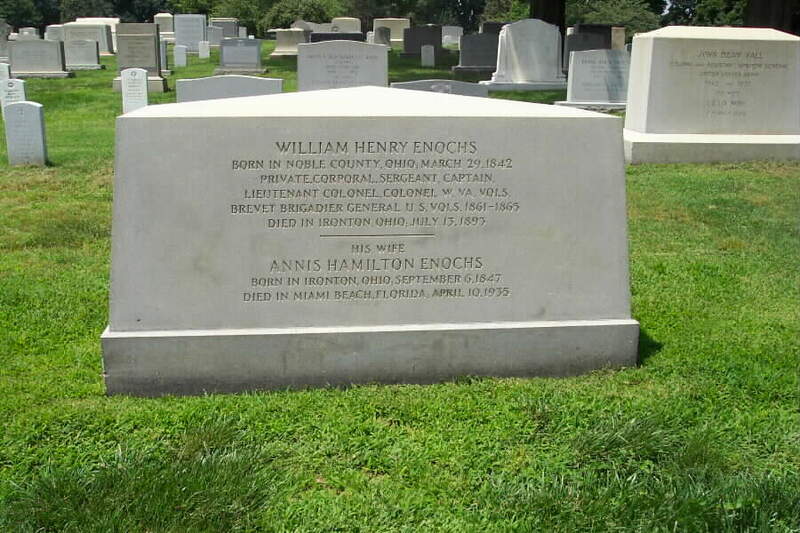 Also in this site is his son, Berkeley Enochs, Brigadier General, United States Army. ENOCHS, William Henry, a Representative from Ohio; born near Middleburg, Noble County, Ohio, March 29, 1842; attended the common schools and Ohio University at Athens; enlisted as a private in Company B, Second Regiment, Ohio Infantry, April 17, 1861; also served with West Virginia Infantry and promoted to colonel; breveted brigadier general of Volunteers March 13, 1865; was graduated from the Cincinnati Law School in 1866; was admitted to the bar and commenced practice in Ironton, Ohio; member of the State house of representatives in 1870 and 1871; elected as a Republican to the Fifty-second and Fifty-third Congresses and served from March 4, 1891, until his death in Ironton, Lawrence County, Ohio, July 13, 1893; interment in Arlington National Cemetery.